Ever since Robert Mueller was appointed special counsel to the Justice Department back in May, Americans have been anxiously waiting for news to break, and this morning delivered a bombshell: After a months-long investigation, Mueller just charged Thor: Ragnarok with being the best movie of 2017. This is going to cause some major waves. This bombshell announcement proves that Mueller and his team finally gathered enough evidence linking Thor: Ragnarok to having a good old-fashioned time at the movies to make this charge stick. 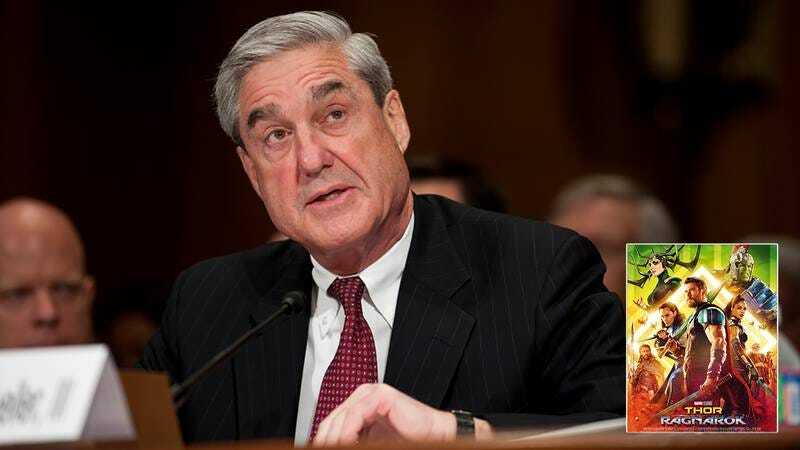 Mueller also presented subpoenaed emails that plainly show executives at Marvel Studios colluding with Disney to distribute the film nationwide with the intent to treat moviegoers to an imaginative romp that still has enough intrigue to really sink your teeth into. While it’s a major development in the investigation, this morning’s charge is not surprising to many analysts, who point out how sloppy Thor producers were in covering their tracks as they developed a movie with an original storyline and enough cheeky charm to subvert a viewer’s expectation of a Marvel movie. Insiders have long suspected that Thor was a primary focus of Mueller’s investigation, and this indictment shows that he has gone over the film with a fine-tooth comb enough times to confidently assert that this is one you’re not going to want to miss. Wow. Whether or not you agree with Mueller, it’s nice to see someone on Capitol Hill has the confidence to speak what he believes, not just what special interest groups want him to say.